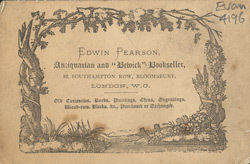 This is a leaflet for Edwin Pearson, bookseller. The number of people who could read and write increased in this period and so bookshops were very popular. Booksellers would have sold as well as loaned books to customers. But they were not confined to selling printed materials, in addition to stationery booksellers sold hairbrushes, compasses, scales, and even musical instruments.